Alicia Bessette writes with compassion and tenderness to illuminate the many unexpected ways people save each others' lives every day-often without even knowing it. 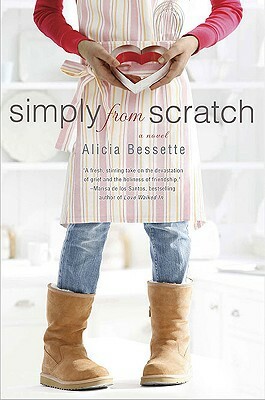 Poignant, bittersweet, and strikingly honest, Simply from Scratch is a radiant celebration of friendship and the strength of the human spirit. Rose-Ellen ("Zell") Carmichael Roy wears her late husband Nick's camouflage apron even when she's not in the kitchen. That's her widow style. It's been over a year since Nick died tragically during a post-Katrina relief mission in New Orleans. Long enough, according to the grief pamphlets, to have begun to move on with her life. But Zell is still unable to enter her attic, which is full of Nick memories. She hasn't even turned on her oven because cooking was Nick's chore. That is, until she decides to enter the first annual Desserts that Warm the Soul baking contest, hoping to donate the grand prize to Katrina survivors in Nick's memory. Meanwhile, Zell's nine-year-old neighbor, Ingrid Knox, is learning to cope with the loneliness of growing up without a mother. With an imagination as big as her heart, Ingrid treasures her doting father but begins to plot how she will meet the woman who abandoned her so many years ago. When an embarrassing baking mishap brings Zell and Ingrid together, they form an unlikely friendship that will alter both of their lives forever. Together, and with the help of a lively and loveable cast of friends and family, Zell and Ingrid embark on winning the Desserts that Warm the Soul contest - and learn that through the many sorrows and joys of life, with a little bit of flour and a pinch of love, anything is possible.